2017 UTA Artist Space, Los Angeles, CA. "Embassies"
Brand New Gallery, Milan, Italy. "Casitas"
Leila Heller Gallery, Dubai, United Arab Emirates. "Desert Bloom"
Harper Books, East Hampton, NY. "Nudes"
2015 Koenig & Clinton, New York. "Digs"
Peter Blum Gallery, New York. "One World Trade Center"
The Philip Johnson Glass House. 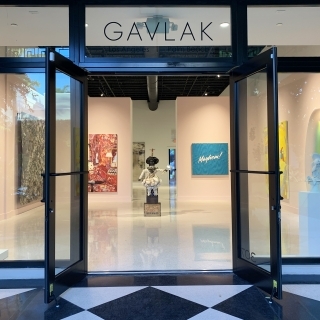 New Canaan, Connecticut, "Lipstick"
Galerie Nathalie Obadia, Paris. 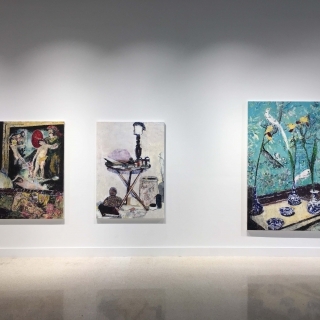 "Recent Paintings"
Danziger Gallery, New York. "Cut-Outs"
2014 Harper's Books, East Hampton, NY. "Summer Jobs"
Thomas Ammann Fine Arts AG, Zurich. "New Work"
Le Royal Monceau, Paris. "Paintings"
2013 Galerie Nathalie Obadia, Paris. "Paris Mon Amour"
Acquavella Galleries, New York. "The Good Days"
2012 Corcoran Art Gallery, Washington D.C.. "Utopia"
2011 Galerie Nathalie Obadia, Bruxelles. "Works on paper"
Faggionato Fine Arts, London. "Nudes"
2010 Acquavella Galleries, New York. Galerie Michael Janssen, Berlin. "Monochromes"
2008 Galerie Michael Janssen, Berlin. "Tender"
Collezione Maramotti, Reggio Emilia, Italy. Faggionato Fine Arts, London. "Suite 720"
Galerie Nathalie Obadia, Paris "Faraway"
2006 Mitchell-Innes & Nash, New York, NY, "New York"
Faggionato, New York, "Works on Paper"
Mario Diacono at ARS LIBRI, Boston, MA, "The United Nations, New York"
2004 The Happy Lion, Los Angeles, CA, "Caribe Club"
Sammlung Sander, Berlin, Germany "The Party"
Elizabeth Dee, New York, NY "Works on Paper"
2003 Elizabeth Dee, New York, NY "Monuments"
2002 Kunstverein Heilbronn, Germany, "Holiday"
Elisabeth Dee Gallery, New York, NY, "New Work"
Dee / Glasoe, New York, NY "Enoc Perez"
2001 Galerie Michael Janssen, Cologne, "The Secret"
1999 Bronwyn Keenan Gallery, New York, NY, "Winter"
Turner & Runyon, Dallas, Texas, "Daydreaming"
2016 Chimento Fine Arts, Los Angeles, CA. "Enoc Perez & Carlos Rolón/Dzine"
Roberto Paradise, San Juan, PR. "Casitas"
2017 König Galerie, Berlin, Germany. "THREE POSITIONS. SIX DIRECTIONS. CHAPTER II: DOOR TO THE FUTURE, WINDOW TO THE PAST"
Brintz Galleries, Palm Beach, FL. "Garden Party"
Marc Straus Gallery, New York, NY. "Lob des Schattens"
Joyce Varvatos, Sag Harbor, NY. "Chaos Theory"
Kim Heirston, Bridge Hampton, NY. "Endless Summer"
Leila Heller Gallery, NY, NY. "Grisaille"
2015 Planthouse Gallery, New York, NY. "Exquisite Corpse"
BYU Museum of Art, Provo, Utah. "No Place Like Home"
Pavillon de I'Arsenal, Paris. "Dimensions Variables"
Edward Tyler Nahem Fine, New York. "Metropolis"
2013 MICA, Chicago. "City Self"
AD&A Museum, California. "POP: Politics of Place"
2012 Collezione Maramotti, Italy. "Painting as a Radical Form"
Galerie Nathalie Obadia, Bruxelles, "In Between"
Museum of Contemporary Art ,Chicago. "Skyscraper: Art and Architecture Against Gravity"
Joan Prats Art Grafic, Barcelona. "Jorge Pardo / Enoc Perez"
2011 Espacio 1414, Berezdivin Collection. San Juan. "Painting…Expanded"
2010 Galerie Nathalie Obadia, Bruxelles, "Portraits"
Gagosian, Los Angeles, "Meet Me Inside"
Galerie Nathalie Obadia, Bruxelles, "Best of"
2009 Collezione Maramotti, Reggio Emilia, Italy, "Transitions: Painting at the (Other) End of Art"
Faggionato Fine Arts, London, "Works on Paper"
2008 Aldrich Contemporary Art Museum, Ridgefield, CT, "Painting the Glass House"
2007 Triennale Bovisa, Milan, "Timer 01/Intimacy"
Derek Eller Gallery, New York, NY. "NeoIntegrity"
Galerie Michael Janssen, Berlin, Germany "Blood Meridian"
Faggionato Fine Arts, London, "Small Format"
Galerie Michael Janssen, Cologne, "10 Years! Galerie Michael Janssen"
Perugi Arte Contempoanea, Padova, Italy, "Ciao Manhatten"
2004 UCLA Hammer Museum, Los Angeles, CA, "The Undiscovered Country"
Real Art Ways, Hartford, CT; Museo de Arte de Puerto Rico, San Juan, "None of the Above: Contemporary Work by Puerto Rican Artists"
Galerie Tanit, Munich, Germany, "Looking at Painting 2"
2003 Kunstverein, OldenBurg, Germany "hands up, baby, hands up"
Feigen Contemporary, New York, NY, "Environs"
The Happy Lion, Los Angeles, CA, "Preview 2003"
Painting the Figure since late Picabia"
2001 Museo de Arte de Puerto Rico, San Juan, "Art in Puerto Rico through the Ages"
Exit Art, New York, NY, "Boomerang: Collector's Choice"
Kelowna Art Gallery, Kelowna, British Columbia, "1900-2000: Paintings from a Misshapen Century"
1999 Museum of Contemporary Art, Lake Worth, Florida, "At Century's End"
Bellevue Art Museum, Bellevue, Washington, "Fresh Flowers: Floral Imagery in Contemporary Art"
El Museo del Barrio, New York, NY, "The S-Files: The Selected Files"
1998 Turner & Runyon, Dallas, Texas, "Encyclopedia 1999"
Thread Waxing Space, New York, NY, "Message to Pretty"
Gavin Brown's Enterprise, New York, NY, "Home & Away"
1997 Bronwyn Keenan Gallery, New York, NY, "Road Show '97"
1996 The Art Exchange Show, New York, NY, "The Most Important Thing in the World: Oasis vs. Blur & Artists Who Rock"
1993 White Columns, New York, NY, "Update 1993"
Luigi Marrozzini Gallery, San Juan, Puerto Rico, "Pequenos Formatos"
Corcoran Art Gallery, Washington D.C.